Choosing to become a Count or Countess invites you into a world of exclusivity and high social status. The title “count” originates from a Latin term of address meaning “companion”, which was given to high-ranking individuals who served the Roman Emperor. 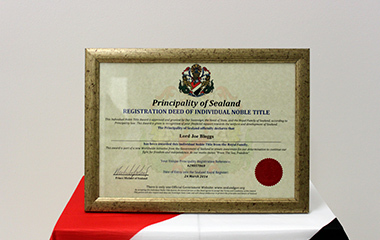 Being a Count or Countess of Sealand secures your position within the Royal Peerage of Sealand, proved by the official documents you will receive once you acquire your title of Count or Countess. Sealand sits seven miles off of British shores, an independent micro-nation which represents the courage and determination of the people who fought for the independence of Sealand. BECOME A COUNT OR COUNTESS! 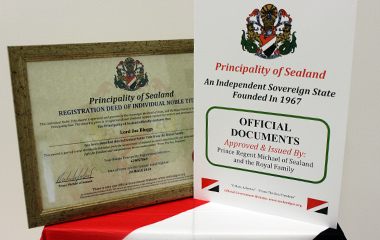 By purchasing the additional extra of owning a piece of Sealand Territory you will contributing to the maintaining and upkeep of the independent state which you are a valuable part of for years to come. 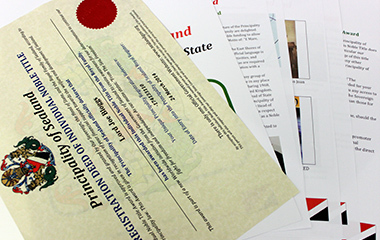 You will receive a Property Title Certificate to certify your proud ownership of a Square Foot of Sealand Territory. 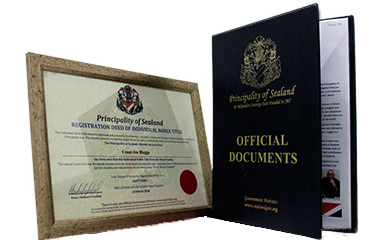 When you become a Count or Countess you will receive your personally signed and framed Individual Title Deed by Prince Regent Michael of Sealand as well as a personal proof of Title Gold Card and an elegant Official Documents Folder. Also featured in your Count or Countess Title pack is information on your new homeland; including information on the location of Sealand, the history of Sealand, the structure of the Government and a complete World Fact Book entry. Also included are photos of the Principality and its Royal Family and Biographies of Prince Roy, Princess Joan and Prince Regent Michael. If buying as an unique gift for someone or if you wish to acquire this privileged title for yourself, ordering your Title Pack is quick and easy and we will issue you with your Count or Countess Title as soon as we can. Becoming a Count or Countess is a privilege and a chance to be a part of an elite, royal class. Can I Get My Count Or Countess Title Delivered To The USA? Yes, we can deliver all of our title packs to The USA. Orders will take between 5-10 days to be delivered. Can I Purchase An Online Version Of My Title? With all Count and Countess titles, we issue a PDF version to be accessed immediately through email. Ideal for when purchasing as a last minute gift. How Long Is My Count Or Countess Title Valid For? Your Count or Countess title is valid for a lifetime, there is no expiry date and you will forever be a part of Sealand. Is There A Record Kept For All Count/Countess Purchases? Yes, we keep a secure record of all Count and Countess titles purchased but only the Sealand Royal Family have access to the Royal Register. What Extras Do I receive With A Count Or Countess Title? Our Countess titles are one of the highest titles of nobility we offer, in addition to your signed and framed title deed, you will receive a proof of title gold card, a documents folder and an abundance of information, insights into Sealand, photos and biographies. Can I Return My Count Or Countess Title? We hope you are extremely pleased with your Count Or Countess title but if you do wish to do so, our customers are granted with a 7 day cooling off period, if the item is damaged, this window increases to 28 days.